We’ve all heard about the host of golden daffodils, and wand’ring lonely as a cloud. But what was it about the Lake District that inspired an entire cultural movement? I wanted to find out for myself, to read between the lines of verse and see the landscape that launched a thousand couplets. I am following in a long line of travellers, inspired to climb these hills and walk beside these lakes by a group of writers and artists who redefined how we viewed nature. In the late 18th century, with the era of the Grand Tour on the wane and city life increasingly uncomfortable, people started travelling here, and to other wild landscapes across Europe, to embrace the natural world as a means to restore health and harmony. In April 1802, a young William Wordsworth, accompanied by his sister Dorothy, walked along the southwest bank of Ullswater, hugging the lakeside path towards Glenridding. The flowers “outdid the sparkling waves in glee.” That moment, frozen in time and alive with the sheer vitality of spring, moved him to pen the famous opening stanza of Daffodils. The celebrated poet went on to write some 70,000 lines of verse in his lifetime – more than any other English poet. The visceral beauty of the Lakeland landscape had become a muse. And he repaid it in kind: Wordsworth’s vision of the Lakes has shaped how we see the area today. Cumbria remains defined by its natural features to this day: the rugged, weather-eroded hills, the yawning, lush valleys and the gently lapping waters of its lakes, meres and tarns. Britain has plenty of natural beauty but, despite the encroaching coach tours and souvenir hunters, the Lake District remains its wild-man heartland. They were soon joined in Cumbria by other heavyweights from the cultural scene of the day, notably the poet Robert Southey, to form an Establishment-challenging band of young literary gunslingers known as the Lake Poets. But Wordsworth’s lyricism didn’t lead to instant acclaim. Lord Byron, reviewing Wordsworth’s Poems in Two Volumes in 1807, found couplets devoted to birds, daffodils and streams to be childish. “What will any reader out of the nursery say to such namby-pamby,” he wrote. Other critics took to cruelly parodying his work, but Wordsworth remained sanguine, confident he had captured something of the human condition, man’s relationship with nature in his verse. He also had the last laugh. By the time he was appointed Poet Laureate in 1843, the critics were lauding Wordsworth’s rallying call to travel through nature as the perfect antidote to Britain’s increasingly urban lifestyle. Travellers came in increasing numbers to explore the region that inspired his words, a tourism industry was firmly established and other poets followed in search of similar inspiration. It’s a literary tradition that continued through Beatrix Potter and Alfred Wainwright to Arthur Ransome of Swallows and Amazons fame and John Cunliffe, whose stories about Postman Pat and his faithful cat have delighted generations of children. The Lake Poets blazed the trail and Wordsworth was their de-facto leader. The journalist Stuart Maconie, a passionate advocate of wild landscapes, likens the poets to punk rock. Romanticism, like punk, changed everything in its wake. Sadly, the well-trodden tourist trail of the central Lakes fails to provide the edginess of punk, instead turning a revolutionary philosophy into a network of chintzy tearooms and craft-filled gift shops. Is it still possible to rediscover the radical fervour that drove the Romantics? After all, the Lake District is hardly a fragment of landscape frozen in time. I believe it is. That’s why I’m pulling off the M6 on a blustery day in early April and following the signs for the North Lakes. I wanted to catch the first bloom of spring, to share in a moment so indelibly linked with the Romantics. It hadn’t been the most romantic of starts – just a swathe of landscape-dissecting motorway and lunch at an anodyne motorway services. But, as I trundle down the first of many country roads, my heart swells. The dainty heads of pinprick wild flowers are already hinting at vital signs by the roadside. I’m heading across the top of Lake District National Park (Britain’s second such park after the Peak District in 1951) to Cockermouth, a sturdy Cumbrian market town on the banks of fast-flowing, flood-prone River Cocker. Here, a Georgian townhouse marks the start of a Wordsworth trail that offers moments of intimacy among the tour groups. The young William spent, in his own words, “Half his boyhood running wild among the mountains,” and it was during his early childhood that he developed his love of the Cumbrian countryside. The National Trust now owns the Wordsworth House and Garden, which was restored using records from the Wordsworth archive and fulfils a living-museum role with costumed interpreters keeping the house alive. Away from the bonneted servants and quill pen and ink demos, I catch a glimpse of Wordsworth in the walled garden, still planted with 18th-century vegetables, fruit, herbs and flowers, such as lemon balm (good for stings) and garlic chives (a natural remedy for nausea). My next stop is a tourist hotspot, with coach parties and time-limited tours. It’s Dove Cottage, the ramshackle former coaching inn outside Grasmere that Wordsworth and Coleridge discovered on a walking tour of Cumbria. The cramped, whitewashed cottage provided the growing Wordsworth clan with a family home from 1799 to 1808. He wrote much of his best-known poetry here, and his sister Dorothy kept her famous diary, later published as the Grasmere Journal, while living in the cottage with William, his wife Mary Hutchinson and, later, their three eldest children, John, Dora and Thomas. The charitable Wordsworth Trust now manages Dove Cottage and the adjoining Wordsworth Museum and Library, which houses one of the greatest collections of manuscripts, books and paintings relating to British Romanticism. The collection includes over 90 per cent of Wordsworth’s surviving manuscripts. Pick a quiet moment, or avoid the tour altogether and beat the hordes to the visit’s scholarly denouement, for a sense of the man reading, editing and re-writing these lines for the first time, long before his punk-rock prose was tamed by inclusion in school textbooks and tourist brochures. Wordsworth would feel at home here, scribbling away in the half light. He would, doubtless, despise the brouhaha of the gift shop. Rydal Mount, just a short drive towards Ambleside hugging Rydal Water dappled with morning sun, feels more intimate with its homely entrance hall, easy-going ambiance and collection of family heirlooms. This was Wordsworth’s family home for 37 years from 1813 to 1850 and the property marks the 200th anniversary of Wordsworth’s arrival in May this year. The family settled into a more stable lifestyle at Rydal Mount, buoyed by earnings from William’s writing and lectures. He revised many of his earlier works while living at Rydal Mount and completed the final draft of Daffodils here in 1815. Today the house remains privately owned by the Wordsworth family and retains a lived-in, welcoming ambience, offering a personal take on the Wordsworth story – an insight into William as the family man. You can even sit in Wordsworth’s chair overlooking the terrace and admire the spring flowers bursting into life. While the house contains portraits, personal possessions and first editions of the poet’s work, it’s in the four-acre, Romantic-style garden that I feel closest to understanding what motivated Wordsworth in his craft. He loved to potter here, and it remains as he designed it with rare shrubs, such as Smooth Japanese Maple and Japanese Red Cedar. Wordsworth joked that, if he hadn’t been a poet, he would have wanted to be a gardener. 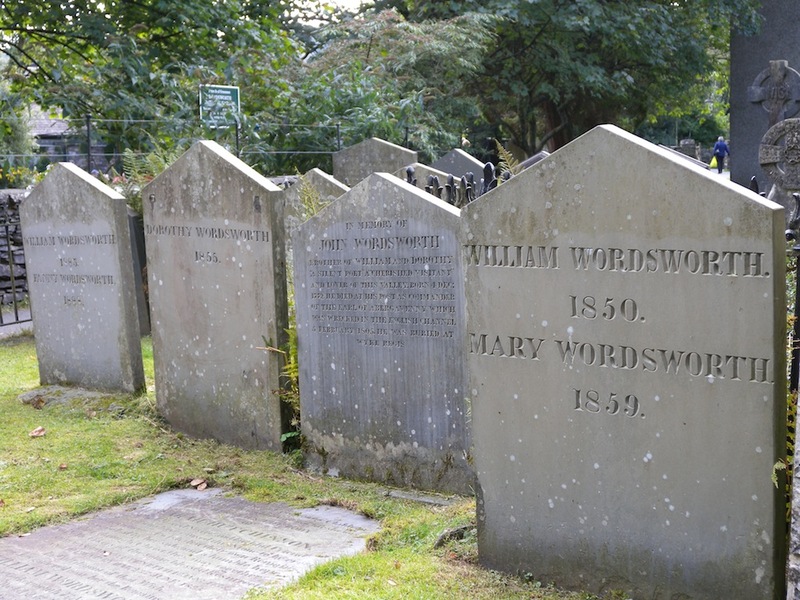 The Wordsworth family grave [pictured above] is the in the grounds of St Oswald’s Church, which lies at the heart of Grasmere village. The weather-stained graves of William, Mary and Dorothy, as well as the children Dora, William, Thomas and Catherine, are regularly decorated with displays of fresh flowers from well wishers. Behind the graves, the Wordsworth Daffodil Garden skirts the fringe of the graveyard. Wordsworth once described Grasmere as “the fairest place on earth” and, on a calm spring day with the daffodils gently bathed in spring dew, you can almost feel his words still resonating around the village on the breeze. Relishing these moments of insight, I aim to find out more about the Romantics by tracing the footsteps of Wordsworth’s fellow poets and the generations of artists who followed in their wake. While Coleridge is also well-known, the role of Robert Southey, another poet of the Romantic school and Poet Laureate from 1813 until his death in 1843, is only just being rediscovered. Their lives entwined at Greta Hall on the fringe of Keswick, an evocative Georgian pile where Coleridge lived from 1800 to 1803 and Southey from 1803 to 1843. Today the property, swirling with the ghosts of the past, combines self-catering accommodation in the Coleridge Wing with a space for literary-salon events in the book-lined study where Southey once toiled. Outside, the grounds resonate to the sound of the ducks rampaging through the wildflower-strewn borders. Coleridge, prone to dabbling with opium and nature-inspired wandering, left his family behind at the house in Southey’s care (their wives were sisters). He produced great works, notably The Rime of the Ancient Mariner and Kubla Khan, but the family suffered from his prolonged absence. Southey remained behind to provide for the families living under his roof. The early 19th-century house was purchased by the Palmer family in 1996 as a run-down schoolhouse and re-opened to guests in 2002. For them, the house now serves to highlight the much-overlooked contribution made by Southey. While his poetry was primarily observational and often ridiculed by Wordsworth, his academic work and hard-working nature earned him wider respect in the literary community of the day. His story The Three Bears (1837), today displayed in a case in his study, is the original take on the now better-known Goldilocks fairytale. “Southey was the rock that enabled the Romantic Movement to grow,” explains owner Jeronime Palmer, showing me around rooms where Coleridge slept and Southey dined with the likes of Wordsworth, Byron and Keats. That night, I settle down under the covers of an elaborately carved Chinese opium bed, not an original piece but one, no doubt, Coleridge would approve of, to read works by the poet. The house creaks and groans around me while dusty tomes, leather bound and crinkly paged, litter the bedspread. I can imagine the poets poring over their manuscripts in the same way, propped up on pillows with moonlight over the fells beyond the window. I drive onwards from Keswick towards Coniston, tracing mud-splattered arc in second gear round windy country roads, cruising past snow-topped fells, to find traces of a philosophy that added to Romantic ideals with scientific discoveries inspired by nature. While the Romantics were busy crafting purple prose about the beauty of the Lakes, a new movement of artists was also discovering Cumbria. JMW Turner, Gainsborough and, later, Constable all journeyed north in search of those quintessentially brooding Lakeland vistas. Most importantly, it is the Victorian polymath, John Ruskin, who picked up the mantle and took the Romantic Movement forward to a new era. By 1872, when Ruskin moved to Brantwood House, an elegant, stately home on the peaceful eastern shore of Coniston Water, the Lakes Poets were long dead. Wordsworth had become increasingly disillusioned with what he saw as the invading hordes and Coleridge, a victim of ill health and opium addiction, had settled into a steady decline. But Ruskin, the artist, writer and social reformer, took their ideas, blending them with his patronage of Turner (his collection today features 140 Turner works) and his friendship with Charles Darwin. His ideas would inspire a new generation of thinkers, writers and activists, Ghandi and Tolstoy amongst them. “His vital role was taking the notion of nature as an inspiration to the human spirit and reconciling it with the scientific world,” explains Brantwood’s Director Howard Hull as we soak up the ambiance in Ruskin’s well-preserved study, an impressive, heavy-wood armillary sphere taking pride of place in the centre of the room. Ruskin expanded the property according to his idea of ‘organic architecture’, incorporating elements of the burgeoning Arts and Crafts movement. I spend an idyllic morning exploring the 250-acre estate, skipping from an art exhibition of Ruskin’s uneasy relationship with women (soon to be the subject of a film by Emma Thompson) to a modern update of his rock lithophone, a kind of stone-mineral xylophone, is on display in Linton Room. Copies of his seminal work on social justice and equality, Unto This Last (1860), are doing a brisk business in the gift shop. Most impressive of all is the array of contrasting gardens as nurtured according to Rukin’s vision. The eight sections, arranged over a hillside behind the property, include a herb garden, Victorian herbaceous borders and the Zig-Zaggy, inspired by Dante’s Inferno. The High Walk is particularly impressive in spring with wild spring beds of flowers giving way to fine views across lapping Coniston Water. Ruskin had an ability to link complex issues, such as social justice, economics and conservation, with great clarity. Brantwood was always a place of warmth, contemplation and debate. From the ivory towers above Coniston Water, I choose to end my journey through Romanticism by immersing myself in the original spirit that inspired its founders. I head back towards the North Lakes, following near-deserted country roads beyond the fringes of the National Park to find the daffodils blossoming the southwest bank of Ullswater. Shorter and stubbier than other varieties, their yellow heads are pushing upwards in search of spring. The frost can permeate into May around these parts but I can already feel nature stirring in early April: the snow melt on the top of the St Sunday crag, Canadian geese chattering over Norfolk Island and, most of all, the golden host beside the dark-watered ribbon lake. I spend a moment admiring the views from what is known locally as Dora’s Wood, before taking the Ullswater Steamer towards Pooley Bridge. The mist-shrouded lake has a spectral quality, the changing of the seasons heralding new life around me. I finish my walk through the landscapes that informed and inspired Wordsworth’s work, heading up to the waterfalls at Aira Force in the shadow of Gowbarrow Fell. The trail, immortalised by Wordsworth in The Somnambulist (1833), takes me through a wood of Irish Yew and Silver Fir, inhabited by red squirrel and red deer. It is tranquil yet deliciously alive. It took something as simple as spring flowers to spark a new cultural movement. Here, surrounded by the stirring of spring high above Ullswater, I too feel the power of nature in the North Lakes as something tangible, something immense, something that could truly change the world. The nature makes me feel alive. “No part of the country is more distinguished by its sublimity,” wrote Wordsworth. Some two centuries on, his words still ring true. * This store was commissioned in 2013 by TRVL magazine; I first blogged about this commission in On the trail of the Romantics. Liked this? Try this: Top 10 Lake District with Kids. Wonderful evocation of the Romantic poets and their profound effect on modern thinking. Thank you! Thanks for your kind comment; glad you enjoyed the story. Thank you for the insightful commentary. I hope to visit the Lake District next spring. You’ve convinced me to travel in late April or early May. Love the Romantic poets.